Since yesterday morning, the situation in Japan has become much more serious, which is hard to believe considering the damage already done. The Fukushima Daiichi (#1) nuclear power plant suffered a third hydrogen explosion, followed by a serious fire that resulted in the release of more radioactive materials into the atmosphere. This is in the wake of an update on the death toll: Over 3600 confirmed, with thousands more unaccounted for. This is already the most loss of life Japan has faced in a national disaster since WWII, but the death toll is still on the rise. No country in the world is more prepared for earthquakes than Japan, but the Great Tōhoku Earthquake set off a cascade of catastrophes that are still unfolding beyond our most imaginative nightmares. After the earthquake on March 11 caused a tsunami to raze entire towns and cities in the Tohoku region, the eyes of the world are now fixed on Fukushima’s Daiichi nuclear power plant. To be clear, Japan doesn’t want to use nuclear power, but there isn’t coal, gas, or oil here, so Japan simply needs nuclear power. The Fukushima plants are 40 years old, and sadly, they were supposed to be “retired” soon. Even though Japan was working with slightly outdated nuclear technology, they were well prepared for most of the problems that were likely to arise. However, a tsunami can’t be planned for, and there aren’t really any ways to defend against one. From what I understand about these nuclear plants, a pump is supposed to spray water into the containment building, which reduces the temperature and pressure. The problem is that the pumps haven’t been working since an hour or so after the earthquake. So workers have been releasing pressure (which lets out radioactive material into the air), and trying to use seawater to cool the inside. If it gets too hot, the fuel will interact with water to form zirconium and hydrogen. So when they later release the pressure, they also release some hydrogen. If enough hydrogen interacts with oxygen, it causes the reactor buildings to explode, which is what we’ve been seeing for the past few days. Today, white smoke has been seen coming from the fourth reactor, and while there are yet no plans to expand the 20km evacuation zone further, it is believed that these vapours are radioactive. This is not confirmed yet, but radiation readings have been fluctuating since then. Until now, workers were manually pumping sea water onto the volatile reactors in order to cool them, but this was risky. Each worker on the ground had to take turns pumping water, and could only do so for a few minutes at a time. Today, the strategy changed, and Japan’s Self Defense Force (SDF) started using helicopters to spray water. Both ground and air methods are being tested now. However, the radiation levels were so dangerous that all cooling attempts had to be suspended for a brief time. So cooling can only be attempted now if the conditions are right, making the situation more dangerous every moment. Yesterday morning (Tuesday, the 15th), an explosion at the second reactor preceded the release of radiation directly into the atmosphere. In two hours, it released as much radiation as it normally would in one year. Also, while the wind usually blows East, out to sea, it instead blew South, making all of this the worst nuclear crisis the world has seen for 25 years, second only to Chernobyl. Luckily, my work is cancelled until Friday, and I was allowed to leave work early in order to stock up on food, since I was running very low since Monday. Not owning a car, I made a few trips to buy food, just in case. It was an odd sight to see the long line-ups, among empty shelves and dazed shoppers. I couldn’t believe that a particular place I frequent was out of rice; luckily, the third store I went to had plenty of 10kg bags. As I came home, I looked at the gloomy sky and had to remind myself of the precautions I had heard over the last several hours. As soon as I shut my door and locked it, with less than an hour to spare, I decided that I wasn’t leaving until it was necessary; the outside was poison. …Is this where phobias come from? Japan is now in need of energy. Rolling blackouts have been implemented since a few days ago, affecting 5 million homes in the Kantou and Tohoku regions. In order to conserve power, everyone is being asked to reduce their electricity consumption, which I take very seriously. It’s frustrating to feel so powerless, but this is one of the best ways I can directly contribute to the aid of disaster victims. So I’m spending my night in an otherwise pitch-black room, using the computer as my lantern, and the internet as my distress beacon. I don’t need help myself, though; I’m actually one of the lucky ones. For one thing, I get to sleep on a mattress tonight. 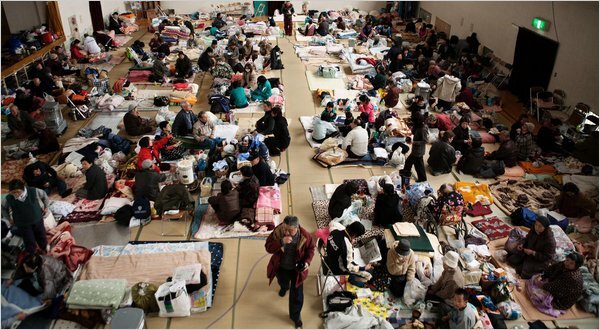 Today, about 440,000 people (from 10 prefectures) are in shelters which are far too packed. Some shelters have, for example, ten bathrooms for 2000 people. Pain killers and other medicines are rationed, though not everyone can even receive a single pill. Elderly survivors are especially in trouble, because they do not have their prescription medicines. Many people in the shelters are living on one ball of rice per day. There are a few heaters for thousands of people in shelters, and if you have never been to Japan in the winter, trust me when I say: the insulation in Japanese buildings is absolutely awful. Also, it’s now below freezing in Northern Japan, and places like Sendai (the biggest city to be devastated by the tsunami) are currently being covered in snow, making it that much harder for the already cold shelter-ridden survivors. It is expected to get colder tomorrow. Vehicles are now only allowed to drive into the affected areas if they have police authorization, which is hindering attempts to distribute food to the most desperate places. Furthermore, a lack of gas is making it difficult for ambulances and other supply vehicles to get there. Also, I mentioned in my earlier post that there was expected to be another aftershock of huge proportions (over M7) by the 16th. Fortunately, it never came, but the warnings of such an earthquake have not gone away. The Japanese Meteorological Association announced that the chance of such an aftershock has dropped from 70% to 40%. In addition to this good news, a number of reports are saying that there’s a good chance the wind will change direction and head East by the end of today, which would hopefully push the radiation out to sea. Here in Japan, the radiation scare brings back images of the atomic bombs of WWII. A few years ago, it was shown that Hiroshima A-bomb survivors who were exposed to low doses of radiation still had high risk for cancers (Watanabe, Miyao, Honda, and Yamada; 2008). And in another massive 15-country epidemiology study, the authors write: ”A significant association was seen between radiation dose and all-cause mortality [...] [which is] mainly attributable to a dose-related increase in all cancer mortality” (Cardis, Vrijheid, Blettner M, et al; 2007). This explains why so many embassies in Tokyo have relocated to cities such as Kyoto and Kobe, where the radiation levels are negligible. People are afraid to stay here. What’s ironic is that flying actually exposes people to more radiation than being on the ground in Tokyo right now. Radiation exposure is inevitable in our lives (in small doses), whether it’s flying on a plane or getting an x-ray. But what’s scary is that you can’t see the radiation, so you have no way of knowing if you’re about to ingest radioactive material, unless you have a special device at your disporal. Furthermore, the radioactive material from the power plants may be around for years. Chernobyl still has an exclusion zone. I’m not panicking, but a meltdown is sounding quite likely as time goes on. It has been suggested by some that the government may be downplaying the meltdown threat to limit the potential damage to the economy and avoid causing nationwide panic. The word “meltdown” probably sounds worse than it is (mostly due to movies like The China Syndrome), but I can hardly fathom the implications of those reactors getting too hot. All I know is that experts all seem to think that this nuclear disaster can’t possibly turn out as bad as Chernobyl. As the weather cools and the wind blows East, we’re just hoping that nature doesn’t have any more surprises in store. But knowing our luck, we might soon get nuclear rain, which is a possibility if there is a meltdown in the reactors. Furthermore, if a major explosion sends a radioactive plume of dust into the atmosphere, it could be blown across the ocean to nearby countries. So clearly, this isn’t just Japan’s problem. It’s everyone’s problem. It’s just that Japan is dying for help now. 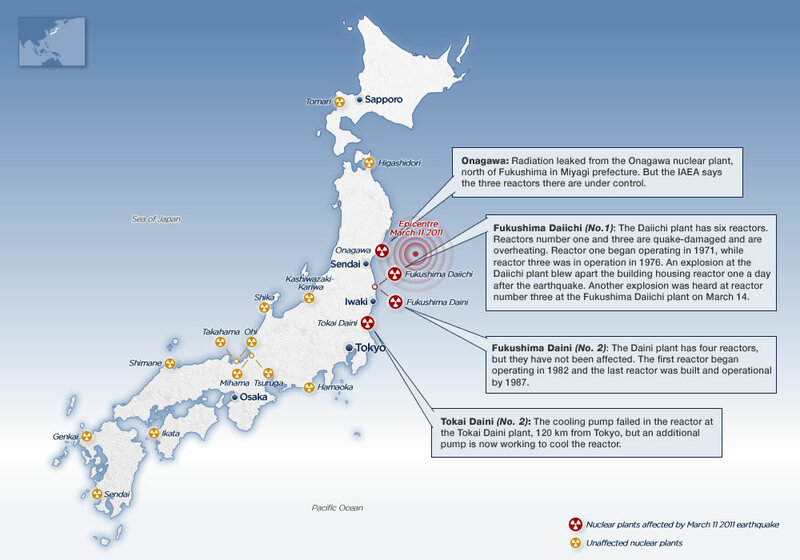 Fukushima Well on It's Way to "Cold Shutdown"
This entry was posted in Blogging, Japan, Medicine & Health, Science, Technology and tagged natural disasters, radioactivity. Bookmark the permalink.